New York may be a teeming metropolis, but it is also a gateway to the tranquil Hudson Valley, with its orchards, vineyards, fine restaurants and stately homes that have afforded escape to some of the great names in American history—Rockefeller, Vanderbilt and Roosevelt among them. Nowadays, there are also several delightful hotels that offer comfort and hospitality, if not always the last word in luxury. 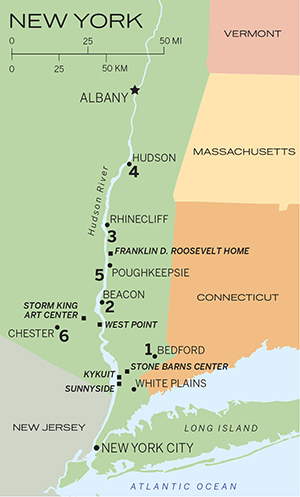 Stretching 315 miles north from New York Harbor to its source in the Adirondacks, the Hudson saw its role as a trade artery magnified with the opening of the Erie Canal in 1825. This connected the river to the Great Lakes, ensuring that New York eclipsed Philadelphia as the largest city on the Eastern Seaboard. But the economic tide ebbed, and during the 20th century, the Hudson Valley fell into decline. Fortunately, the past few years have seen a tremendous renewal spurred by relatively inexpensive real estate, a revived agricultural base—stimulated in part by the farmers’ markets of New York City—and the appeal of the river itself, now cleansed of industrial pollution. We set off from Manhattan on a summer morning and headed to Westchester County. I had long wanted to see Kykuit, the Rockefeller estate in Sleepy Hollow, not only for its architecture and gardens but also for the art collection assembled over several generations that contains sculptures by Picasso, Henry Moore and Alexander Calder. The area’s Rockefeller legacy also includes the Union Church of Pocantico Hills, with stained glass windows by Chagall and Matisse, and the Stone Barns Center for Food & Agriculture, a not-for-profit farm that runs programs on sustainability. We also found time to visit Sunnyside, the home of Washington Irving, America’s first great literary success. The Bedford Post Inn provides an ideal base from which to visit this trove of sights. The property garnered a deal of attention when it opened in 2009 under the ownership of actor Richard Gere and his wife, Carey Lowell. 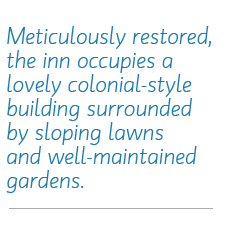 Meticulously restored, the inn occupies a lovely colonial-style building surrounded by sloping lawns and well-maintained gardens. The eight rooms are all done in understated country elegance, with contemporary furniture, dark hardwood floors, small gas fireplaces and, in some cases, diminutive outside decks. Our bedroom was on the small side, but the spacious bath featured a deep claw-foot tub and a walk-in shower. Downstairs, a cozy lounge serves as a combination library, game room and early-evening gathering spot. Having ordered a glass of wine, we opted to sip it beside the lovely reflecting pool to enjoy the sunshine and to page through the glossies laid out on a table by the fireplace nook. Guests also have access to yoga classes in the handsome barn immediately adjacent to the inn. I had been looking forward to dinner at the new restaurant, Campagna, which is under the direction of chef Michael White, whose Manhattan restaurants, Marea and Ai Fiori, I rate very highly. Alas, its opening had been delayed. However, we did not suffer in The Barn, a more casual venue, where the pea tortellini and nicely roasted chicken were more than adequate. The Bedford Post Inn is an enjoyable place to stay in an ideal location for touring. No doubt the new restaurant will add greatly to its appeal. LIKE: Cozy, self-contained atmosphere; excellent food. DISLIKE: Signage to reception is unclear; lack of a swimming pool. GOOD TO KNOW: An outstanding restaurant, The Inn at Pound Ridge by Jean-Georges, is a five-minute drive away. Bedford Post Inn: Queen Deluxe, $495; King Deluxe with Terrace, $650. 954 Old Post Road, Bedford, NY 10506. Tel. (914) 234-7800. From Bedford, we drove northwest for an hour to the town of Beacon. Part of the route ran close to the Hudson, and we caught glimpses of the river flowing grandly between tree-crested hills. Beacon once boasted a strong manufacturing economy, which left a legacy of substantial real estate. The town’s turnaround began in 2003, when the Dia Art Foundation purchased a building where Nabisco had once printed boxes for its cookies and crackers. Dia:Beacon proved to be a draw for urbanites in search of affordable getaways, and the town is now crammed with shops, galleries and restaurants. Developer Robert McAlpine realized the potential in holdovers from the Industrial Age and purchased an old factory site. The opening of The Roundhouse at Beacon Falls in 2012 brought superior accommodations to the town. The goal is to offer 58 rooms; at present, 23 are open. To undertake the conversion, McAlpine turned to the Rockwell Group, which has designed many of New York’s leading restaurants, as well as a number of hotel projects. Our spacious room featured an impressive wall of windows, which looked out to a waterfall on Fishkill Creek. The contemporary décor was simple but stylish, with dark hardwood floors, cream walls and clean-lined furniture. Regrettably, the black slate bath was straight out of the boutique hotel handbook. I dislike black baths, as they seem somehow antithetical to the demands of cleanliness, as well as providing a gloomy setting in which to begin the day. However, the walk-in shower was effective. I had no reservations about the lounge, 2EM, which is well-stocked and well-tended. Observing the barkeep’s dexterity with a muddler, I ordered an Old Fashioned—rye whiskey, club soda and a sugar cube soaked in bitters — which was expertly prepared and served. If you are looking for lighter fare, the lounge’s menu will appeal. However, we opted for the main restaurant, Swift, where chef Brandon Collins offers a locavore menu. The design is industrial, with concrete floors and exposed factory beams illuminated by pendant lamps with large Edison bulbs. Floor-to-ceiling windows overlook the falls. Both the food and the service proved outstanding. I loved my starter of tuna sashimi with noodles, which was followed by superb lamb loin and belly accompanied by asparagus. 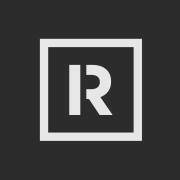 LIKE: Pleasant, courteous and helpful staff. DISLIKE: Parking is inconveniently located. GOOD TO KNOW: The front desk staff are a mine of useful information about Dia:Beacon, the best restaurants and shopping. The Roundhouse at Beacon Falls: Roundhouse Deluxe with View, $260; One-Bed Suite, $400. 2 East Main Street, Beacon, NY 12508. Tel. (845) 765-8369. Despite the insistence of our car’s GPS, the next day, I declined to follow major highways and stayed on local roads. At Poughkeepsie, an old railroad bridge has been transformed into a popular footbridge, the Walkway, which spans the Hudson—more than a mile wide at this point—and affords magnificent views from a height of 212 feet. Twenty-three miles north of Beacon, we came to Hyde Park, site of the home of Franklin D. Roosevelt and Presidential Library & Museum, the Vanderbilt mansion and The Culinary Institute of America, with three restaurants open to the public. Set on a gentle hill amid 236 verdant acres, the Old Stone Farm comprises a cluster of buildings surrounded by mown lawns bordered by split-rail fences. The property is the realization of a dream held by Sherry and Stu Kahn. (Since her husband’s untimely death in 2012, Sherry has been carrying on the business alone.) After restoring an original barn from the 1700s, which now serves as a yoga studio, the Kahns found a similar barn nearby, took it apart and reassembled it. This now contains the inn’s 10 rooms. Done in a refined country style, they have white walls accented by dark beams, wood floors and a pleasing mix of antique and contemporary furniture. Period objects such as old timepieces and naive art add to the charm. 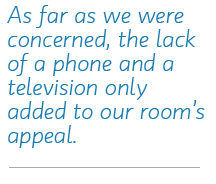 As far as we were concerned, the lack of a phone and a television only added to our room’s appeal. (Wi-Fi is available.) The bath was clad in light gray and white marble tile. Some rooms have tubs, others, walk-in showers. A lovely four-bedroom house is also available for small groups and families. An upstairs lounge in the main barn is decorated with Americana. Outside, rows of Adirondack chairs face the lawn and the horse paddock below. A full list of spa treatments and wellness programs is available, plus yoga classes and a variety of equestrian options. The delicious food prepared by chef Matt Gaines enhanced the enjoyment of our stay. While there is no menu, Gaines will tailor meals to individual tastes or requirements with advance notice. I tucked into the imaginative beet raviolis — with thin slices of beet making up the “ravioli”—and superb Copper River salmon. LIKE: Feeling of deep rural tranquility; excellent food. DISLIKE: Bedroom windows can be opened, but lack screens. GOOD TO KNOW: Sherry Kahn is often about, and it is well worth chatting with her for insights about the area. Old Stone Farm: Room, from $299; Loft Room, from $399; Two-Room Suite, from $599. 2434 State Route 9G, Staatsburg, NY 12580. Tel. (845) 876-3977. We pressed on to the town of Hudson, a once-dispiriting place that is now the poster child for renewal. Though 120 miles from the Atlantic, Hudson became an active whaling port after Nantucket seamen, fearful of retribution following the Revolutionary War, relocated there for safety. The small town became a major center for shipbuilding and whale oil processing. Today, the main artery, Warren Street, displays a wealth of restored Greek Revival and Federalist townhouses, plus numerous antique shops and galleries. The Hudson River School of painting began in Hudson, and the homes of its two progenitors, Thomas Cole and Frederic Church, sit almost directly across the river from one another. The Mount Merino Manor bed-and-breakfast was originally built in 1870 for Frederic Church’s personal physician. A lovely Victorian property, it sits on 100 wooded acres. The owners, Rita and Patrick Birmingham, visited B&Bs around the country, and the results of their research are self-evident. The seven spacious rooms are appointed with period furniture, fireplaces, wood floors and Oriental carpets. The size of the baths surprised me, putting those in many luxury properties to shame. Ours came with a whirlpool tub, though not all rooms have them, so be sure to check when making a reservation. Tables set with crystal, china and fresh flowers make the dining room an elegant place for breakfast. In the late afternoon, following our return from our explorations, we would sit in the chairs on the wraparound porch to gaze over the tranquil lawn. Mount Merino Manor doesn’t pretend to the higher levels of luxury, but is a gracious and welcoming place. LIKE: Secluded setting close to the town of Hudson. DISLIKE: The property needs more than one copy of the daily papers in the morning! GOOD TO KNOW: The breakfast staff can help make reservations for your day’s activities. Mount Merino Manor: Blue Mountain View Room, from $295. 4317 State Route 23, Hudson, NY 12534. Tel. (518) 828-5583. Crossing the Hudson on the Rip Van Winkle Bridge, we headed south. Our itinerary had three priorities: the Storm King Art Center for outdoor sculpture; the United States Military Academy at West Point; and a couple of wineries along the well-delineated Shawangunk Wine Trail. The Buttermilk Falls Inn is set on 75 acres in the village of Milton. The property dates to the 1700s, but it has been updated and expanded. My initial impressions left me underwhelmed. The entryway to the reception area needed painting, and the desk staff were cordial but distracted. However, my spirits lifted when we arrived at our neat, Craftsman-style cottage. Notwithstanding its designation as an “inn,” Buttermilk offers a variety of room options, with 10 accommodations in the main building and eight freestanding structures. Our cottage came with contemporary furniture, a peaked ceiling in the living room, a stone fireplace, a dining area overlooking the Hudson, and a fully equipped kitchen. The two bedrooms were small but comfortable. The single bath was ample in size with a walk-in shower. Henry’s, the inn’s restaurant, can lay claim to being a true farm-to-table establishment. Housed on the second floor of a barn-like structure, it has a casual atmosphere and a lively bar. My favorite dishes were the starter of plump crab cakes with jicama slaw and a zesty lemon aioli, and veal ravioli topped with a generous helping of shredded veal. Elsewhere on the grounds, you can visit Millstone Farm which provides much of the restaurant’s produce in season and includes a livestock barn and a quaint Victorian cottage that houses an aviary with chickens for fresh eggs. A spa provides a comprehensive menu of treatments, plus an infinity-edge pool. DISLIKE: The approach off Route 9 needs better signage; the stretch from Route 9 to North Road goes through an unsightly commercial area (but this in no way impinges on the inn itself). GOOD TO KNOW: There is more to this property than first meets the eye. Buttermilk Falls Inn: Inn Room, from $300; Cottage or House, from $500. 220 North Road, Milton, NY 12547. Tel. (845) 795-1310. Our final destination lay 36 miles to the southwest, 35 minutes’ drive from West Point. I first recommended Glenmere in 2011 and have long anticipated a return visit. The 18-room Gilded Age property suffered from years of neglect and decline before being spectacularly reborn with an investment of $30 million and a renovation that lasted for several years. Driving up the hill, we were greeted by the striking sight of a Tuscan villa with pale blue shutters set amid a classic Northeastern landscape. Formal gardens are strewn with vine-covered arbors, and a broad lawn spills down to Glenmere Lake. Inside, a handful of sparkling public rooms surrounds a sunny cortile. Guest rooms, which range widely from cozy ground-floor nooks to a grand suite with a fireplace in its bath, all feature writing desks, reading chairs and fireplaces with gas log fires. The marble baths are lavish to the point of opulence. The Supper Room is under the supervision of talented chef Geoffroy Deconinck and enjoys a considerable reputation, resulting in a pleasant mix of guests and locals at dinner. We greatly enjoyed Hudson Valley foie gras with cherry marmalade, and scallops with braised endive, followed by Long Island duck breast with red quinoa, and a lobster bouillabaisse with halibut and mussels. Diversions on the estate’s 150 acres include tennis, croquet, a heated outdoor pool and a magnificent full-service spa. Glenmere remains the Hudson Valley’s true class act. LIKE: Exquisite grounds; magnificent spa; superlative cuisine. DISLIKE: Very little, aside from the considerable expense. GOOD TO KNOW: The 65-mile drive from Midtown Manhattan takes around one hour and 20 minutes when the traffic is moderate. Glenmere: Superior Room, from $985; Junior Suite, from $1,460. 634 Pine Hill Road, Chester, NY 10918. Tel. (845) 469-1900.